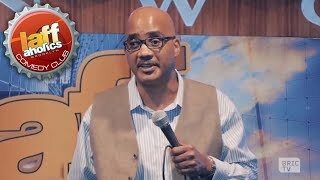 After nine successful years on network television, John Henton has established a name for himself as one of today’s leading comic talents. He is fortunate to be among an elite group of actors who found success on the small screen. He found a loyal and endearing following through the lovable and sensible character of “Overton Wakefield Jones” on the FOX hit sitcom “Living Single,” and the loyalty continued with fans embracing the character of “Milsap” on the sitcom, “The Hughleys.” For its third season, "The Hughleys" moved to UPN, and contributed to the network’s very successful Monday night line-up. "The Hughley's” wrapped its fourth and final season in spring 2002. John’s stellar television work has not gone unnoticed, as he was recognized in 2001 and 2002 with an NAACP Image Award nomination for Best Supporting Actor in a Comedy Series. John Henton’s appeal goes beyond the characters he plays on television as he captivates audiences with his observational and topical humor. John has been very busy spending the summer of 2002 on the road performing his stand-up comedy. Born and raised in Cleveland, John Henton never entertained the thought of a career in comedy. In 1982, while working during the day and studying computer science at night, Henton was urged by a co-worker to try his jokes at a local comedy club’s amateur night. By his second night, Henton won the amateur night contest and began stand-up part time. Henton made the move to Los Angeles in 1985 and by 1988 started his stand-up career full time. Since then, Henton has made appearances on “The Arsenio Hall Show” and “Bob Hope’s Young Comedian’s Special” as well as returning to “The Tonight Show with Jay Leno.” In January 1993, Henton starred in his own half-hour comedy special for Showtime, “John Henton: Comedy With An Attitude." John performed on Comedy Central’s “Premium Blend” to an overwhelming audience response. In April of 1993, Henton was cast in the FOX TV series “Living Single” starring Queen Latifah, Kim Fields and Kim Coles. The show received stellar ratings, and TV Guide selected Henton’s character as one of the “break out” characters of the 1993-fall season. When the show came to an end after five years, Henton was proud and pleased with the work he had done on the show. He continues to be a favorite on talk shows with appearances on "The View," "Late Night With Conan O'Brien," "The Howie Mandel Show," "Roseanne," "Later," "Donny & Marie,” “Fox and Friends” and "Politically Incorrect."